Need t'work on those social skills. When's that gunblogger gathering in Louisville? ...Have a look at Blognomicon's response to an especially yammerheaded statement from a willing victim who wants everyone else to be just like him: Force. Credit for this link to the clever and readable Sister of the Gun Squeaky Wheel, via the handsome and charming D. Martyn Lloyd-Morgan . You do read 'em, don't you? A little something Squeaky and D. Martyn get, Ladd Everitt does not, something which happens to be one of my main ideals, is that while it is perfectly okay* to hold whatever nitwit notion one cares to, it is not okay to require that others share it. I preach rather less than many libby gunbloggers; it's not that I don't want to, but on the way to the keyboard, my attention is taken by something shiny an' motorized on two wheels, or a nice plate of fried 'taters, mushrooms, scrambled eggs and bacon with fresh hot coffee and pastries from Rene's on the side,** and I blog about that instead; or a Farnsworth Fusor goes a bit wonky at the Skunk Works and I craft some vaguely-worded commentary on it; or some other wonder happens by and either way, a nice sermon on freedom of conscience or whatever is left by the wayside. There are, after all, plenty of freedom bloggers who will say it better. But get this: I'm not out to convert nor am I here to utter platitudes everyone will agree with and feel reassured in our shared beliefs; I'm here to tell you it is a very large world indeed, one in which plenty of people find plenty of workable ways to accomplish their peaceable goals in a peaceable manner and every single one of them is okay as long as they're not messin' with you. It's very easy to see evil in things that are really no more than a matter of taste. Now, some people have very good taste and others favor the tacky, and the latter is indeed unfortunate; but the lighted, inflatable, unnaturally-neon-orange pumpkin in their front yard does me no harm at all. I may mock it -- indeed, I just have -- but I'm not going to insist it be taken down as a menace to all that is good and holy. Try to identify the reality of things; try to see what matters and what is simply decoration. It can be difficult to do. I struggle with it. The noise-to-signal ratio of a free and creative culture is very high! But that's a healthy thing. Yammerheads who insist we should all be disarmed "for the common good?" Not healthy at all. Yammerheads who disarm themselves? That's their worry! * Possibly counter-survival but as long as you're not hauling along the unwilling, bye-bye! Bon vo-ah-geey! ** Today's brunch! Hot American coffee properly made, country bacon with black pepper, cajun seasoning on the potatoes and portabellas as they fried, fresh brown eggs from the Organo-Mart scrambled, diced Swiss cheese and Cholula hot sauce to top the finished creation, V8 on the side; dessert was a fresh orange-hazelnut pinwheel from the best and tinest bakery in town. It'll either wake you up or do you in. Good progress at the Skunk Works, for a wonder. We have turned the corner on unmitigated disaster and are into the creative destruction phase, which is always fun. Best quote of the day was from my peer C. Jay, sitting on the floor, tangled in wires, having just dumped his refreshing beverage: "My pants are soaked with coffee and I'm still optimistic!" To give a rough idea of what we're juggling at the Works, imagine we have jury-rigged a small research reactor and are now cleaning out the old one it replaced, preparatory to final installation of the new one; the physical risk is not so high but the financial risk is huge and so's the complexity of the task. Came home and fell asleep watching a Firefly episode, "Out Of Gas." It's a brilliant example of non-linear storytelling, one of the best episodes of one of the best science-fiction series ever put on the tube. (It was cancelled by a short-sighted philistine, of course). My thanks to Bob G for reminding me that I'm still and always a Browncoat. Today, the Skunk Working was a glaze of unavailing effort, simply trying to get back to the level of functionality we had prior to the latest round of "improvements." As ever, much as I might like to detail every little bit of the joy and de-light, that would be tellin'. Plus, this morning my cats were having some elderly-cat issues of a frustrating sort. I was late to work from dealing with said issues, not a clever plan in light of the above. And I worked over the preceding evening with a transmitter problem. Yeah. Oh Woe Is Me: I slept warm and had an adequate breakfast and lunch. Still, I was in a rotten little mood most of the day. Got home, looked at the scooter, realized I need to pick up groceries anyway; did my chores, then geared up* and just about froze my wrists -- I need better cold-weather gloves! -- getting up to the Organo-Mart where I picked up Purina Girl Chow, a/k/a salad-in-a-bag plus some goodies to add to it. By the time I got back home, I was smiling. It's tiny, not very fast and a bit of a challenge to operate, an old-fashioned 150 cc Vespa clone with a slightly clunky manual transmission but it's a joy machine nevertheless. Adding a windscreen so I could ride in colder weather was the best mod I've ever made to a vehicle! * My cold-weather jacket looks like a prop from a bad Sci-Fi movie, "The Last Star Fidgiter" or maybe "Galaxy Kogyaru." I love it! Add the fringed leather chaps, black gloves with faux lepoard-fur trim and jump boots and all I need is a space ship. Er...got one? It's just about bundling-up weather, which means my dear little .380 (Colt Pony Pocketlite, one of the best guns I ever paid too much for) probably should be set to pasture in favor of a pocket gun with more oomph. The question is, which one? I have a slim 9mm (8 rounds) and a nifty .45 (6 rounds), both classics and lightweight, the model BKM and PD, respectively, made by Star. Not modern super-duper wondergunz, but it's not like they get tons of use; I can't carry to work (it's considered rude by the owners) and I try to avoid gunfights anyway. My preference varies -- having 2 more rounds of loud noise and muzzle flash is a good thing. On the other hand, a .45 makes really impressive "eye contact." On the other other hand, I tend to shoot better with a 9mm. Don't have to decide right now. Looks like a warmish week. My dear search 'bots -- and you three self-aware protoplasms, too -- I feel a whine in the air, a temptation to which I shall not yield; feel free to imagine the vastness of the bathos you are thereby spared. "On soft-hearted economists and the short-sighted lenders that made 'em that way:" one of my better -- aw, shux, one of my darn few -- friends thinks the government ought to keep ripoff credit outfits from reelin' in the easy marks. I disagree, but not because fools are born to be fooled. "The tragedy of the common roads:" this is a topic I promised Our Canadian Cousin;* the other way to handle roads is something I have experienced on a small scale, so it won't be all theory and high-minded blather. Look for a special guest appearance from a famous canard, the free-rider "problem." In this context, it might not be much of a problem. And who knows, maybe other stuff. Or I might just chuck it all an' go hang out at the used bookstores, hopin' to find a nice geek who bathes occasionally an' all, a real charmer. The last two days at the Skunk Works have been a good approximation of Hell, only without Samuel Clemens, Oscar Wilde and Ayn Rand jockeying for attention in the seats nearest the fire. I'd love to explain that, but it would be both a whine and tellin' tales that are not mine to tell, so you will just have to imagine. Antacids have nutritional value, right? * Please don't take this whimsical tag as criticism of Canada per se or Canadians collectively or individually; it's just a handy way of referring to my pal and critic whose initials are text-message shorthand. He's right, you know: I'm not human. Or not hardly. There's probably "something wrong" with my "sense of humor," but this gal makes me laugh until tears are rolling down my cheeks and I can't take a decent breath or see straight. Thanks to "Xavier," who has the "link" posted. As planned, I have replaced the pictures with links. Memorial Day, that is, and I hope you have a chance to thank a warrior. If you are a warrior, my heartfelt appreciation to you. Being a little old-fashioned, I stopped for moment yesterday at the eleventh hour of the eleventh day of the eleventh month and reflected on the nature of honor, duty, being willing to go stand up for modern civilization and the men and women who demonstrate those qualities in abundance. As happens, I don't have a very high opinion of President Woodrow Wilson or his nasty foray into European wars. If you ask me the man was a short-sighted racist and those are merely his least-obnoxious qualities; but his likeness to the proverbial toad does not detract at all from the valor of those who, when the call came, took up arms and did the job. --If there's some parallel there to current events, well, how about that. Now, go thank a soldier, sailor, flyboy, Coastie or Marine, okay? So, fifteen bags of trash, five old, beat-up wastebaskets, a 3'-cube wooden crate and assorted dead mops and battered window-blinds later, that minor "bagging up the trash" is done. Hully gee, I had no idea! Spending eight hours in the house where we put undersized filters in the furnace for years and years (and I let it happen by being lazy, I don't think I changed one ever), scrubbing and throwing away, really does wonders to alleviate nostalgia. That's done. It's an odd feeling; I lived in Thunderbolt House for fourteen years, all but one with Mr. Ex. His nice cat Neko and my devoted Janie (who played together, quietly, at night, when the other two cats were asleep) both died there. It was there, over a decade ago, that I answered the phone about eight at night, already in my nightgown, to be told, "We have a working fire at the transmitter;" the following seven days, I took eight hours off to sleep, period. (It could well be that little things like that are why Ex X'ed out. At times, my job demands total attention). That's the place he came to me, worried and angry, when our 10-year-old Jag was totalled while he was waiting at a stoplight; it's the house where I burned my first set of popovers* and where the call came from Mom that Dad was unexpectedly in the hospital and probably not going to wake again. It was most of my adult life. That's also where I found BBSs and teh intraw3b, using a '286 box and a (fast!) 2400 Baud modem, first logging onto Delphi, then a local outfit (who turned out to be a guy selling access "borrowed" from his employers!) and then a little neighborhood provider...which, a few years after AOL tapped into the 'net (it was a big deal then, invasion of the Visigoths!) got snapped up by a big provider, and there went shell access and my by-then antique computer -- and, once I'd replaced that with a modern laptop and a real ISP, there came the Web! Which is most of the rest of my not-so-adult life. And now my old home is empty. Dusty. I've got to go back over and bag up trash and then it will be entirely done. Someone else will call the place home, creaking floors, peeling paint, scary electrical wiring and all. It's an odd feeling. This isn't exactly what I had planned. Had to drop off the moving van at dawn's first light in the middle of a cold autumn thunderstorm. Aha, no problem, I'll dress in layers, I have my poncho, all set. Ha! Soaked jeans and shoes, nice fat drops of near-ice gave me a facial, and the best part was when, riding on rough pavement with a good coating of wet leaves, the poncho blew over my face. Sometimes it's better to be lucky than smart; it all worked out. Brrrrr! * Simplest receipe imaginable, yet easy to get wrong. Sheer heaven when properly prepared! Covering the recent election here in the City of the Big O, the local litter box liner newspaper trotted out voter turnout stats for the last few mayoral elections. Back when Mayor Voted-Out last won, we had a whopping 26% turnout, which the paper routinely decried, yawn. Ex-Mayor-To-Be won that go-round with 60% of the vote. 15.6% of the potental voters, unless my flaky math gene is on the blink. ...This is winning by getting the left-handers to vote for you, or all of [name any smallish minority]. More people bought new cars than voted (which is probably an indication of which activity is more directly rewarding; no argument from me there). Sure, the paper's right, more citizens ought to vote. --But prior to that, it'd be a real help if more citizens were citizens. Many of my fellow libertarian gunbloggers speak very highly of the Constitution of the United States of America. It's certainly a magnificent effort, but let's be realistic: it is beta-level software at best, running with over two dozen major patches (some of them crufty indeed, like direct election of Senators and Income Tax) and uncounted minor ones. It's old software and like all early efforts, it is extremely hardware-dependant. Not so much the "hardware" of buildings or even of institutions; no, the hardware in question is us, or what we were presumed to be by the Framers: a largely aware, informed and engaged electorate. I do not so very much mind a 26% turnout if most of them have done their homework and the other nearly three-quarters have not; it keeps the idiots from pushing the rest of us around by their whims and makes my vote count all the more! But do you really want me deciding who'll sit in the seats of power? My most conventional notions are shockingly radical when compared to the popular wisdom! They might even be far-out compared to many of the ideals you hold dear. And I am probably one of the least inimical voters out there. If you've been sitting out elections, either to protest or avoid empowering a coercive system or simply because you believe it doesn't matter, it might be time to think again. The software's old and flawed but it's running. It's probably fixable. If you want to keep it running, if you'd like to have a chance at making things better, maintain that portion of the hardware you control: yourself, your awareness and your vote. Naturally, the Great Nose Adventure was the topic at the Skunk Works and much joshing ensued. --In the course of the work-like endeavors I undertake, I do all manner of dangerous-appearing things, low tower work, high voltages, difficult spaces, power tools and get nary a scratch, then managed to injure myself working alone, with only pencil and paper, in a safe and comfy operational area. Okay; I had major kidding coming. I did not, however, expect to return from lunch to find this. The boys carefully explained that they were "watching out for me," how nice! And then they explained, with even greater care, how the English phrase "to watch out for [someone]" was, in fact, highly ambiguous and if I was going to attempt a matched set, they wanted to ensure they were nowhere near the scene. That they would be watching out for it. I was relieved at having (just barely) time to vote Tuesday; I was afraid I wasn't going to have a chance to vote against the Mayor! For once, I wasn't the only one. Poll workers said many voters asked who the incumbents were, so they could vote for their opponents! Local news reports concur. Someone -- and I'm pretty sure his initials are L. Neil Smith -- has been pushing the "never vote for an incumbent" meme and I'd like to think it's had some effect here. The fact that city government has made a number of missteps recently, along with voter outrage over some State-level tax idiocy, was undoubtedly the prime mover. With a little luck and even a smattering of good sense, our new Republican Mayor and City/County Council will take the message to hert: they have not received a mandate, they're the player called in to replace a failed team. ...And there's plenty more where they came from, so, new guys? Better give it your best effort! I wish I could tell you I'm holding my breath. I'm tryin' to sign up with this thing. H'mm, it don't seem t'run on steam. Paraffin oil, maybe? Petrol? ...Concerning a troublesome item we've been wrestling with at the Skunk Works for months, I fumed to the Boss's Boss: "They ought to be paying us for beta-testing!" Boss's Boss is the most positive and gentlemanly of men and I expected a mild rebuke. Instead, he looked thoughtfully off into space awhile and quietly said, "That would be presuming the software was up to beta level functionality...."
So I was in the process of kneeling down in front of a rack to get the dimensions of the button array on an 8 x 8 SDI/AES routing matrix (don't worry, it's Greek to most people) and the lads had left a keyboard-in-a-drawer pulled out and the two little thumbscrews that secure it pulled out farther still and -- I don't know. It came outta nowhere! I was too close. One of the furschlugginger knurled ends of a thumbscrew got caught in my delicate, tiny left nostril and I was off-balance: rriip! Invoking the name of a Deity while condemning the situation in heartfelt tones, I clutched at my nose and fell gracefully over on my back, just missing the cold, hard steel of the next row of racks. "Help," said I, "unh, help?" Bleeding profusely -- a talent of mine -- I waited for said help and after five minutes of highly-skilled bleeding, help did appear in the form of a concerned member of the Traffic department. I requested some paper toweling. This arrived in due course, along with responsible authority, who pronounced sentence: "Blood has been spilled. You must go to Occupational Health!" Ninety minutes, one tetanus shot, three Lidocaine beestings and two stitches later, here I am, telling you. Don't try this at home! Really, don't. The doc promises there will not be a scar. Better not! "Reading Your Blog Makes Me Want To Drink Heavily"
In a world of illiterates, the woman with half an Unabridged rules! Boo-yeah. It's all Breda's fault: I spent, oh, geesh, an hour and a half last night bein' domestic, clearing kitchen countertops (so that's where the pocket blowtorch got to! An' the Red Army messkits and my orange hair-ribbon and the old light fixture and...), hand washing stemware and the delicate and pretty Japanese tea set that showed up at a yard sale up the road two weeks ago, etc. etc.. I don't know just how it works. I can sit in awesome squalor watching "Trading Spaces" or almost any decorating-and-home-ec show, and never feel the least twinge; but let my Mom, a co-worker or even one of the bloggers I read regularly start speaking of domesticity and the itch to redd up* the place becomes overwhelming. This is an example of custom (or something akin to it) being better and stronger than law or rules. I'm quite sure I've had kitchens the Board Of Health would've shut down, especially when I was younger and poorer; I have studied all manner of rules and strictures covering husekeeping and still, it's knowin' that other people who are real to me are doing the housewife thing that sets me to work. Fortunately, if you do a just little housework, the urge goes away. * See http://en.wikipedia.org/wiki/Central_Pennsylvania_accent for an explanation. My dialect bears a striking resemblence to this'n. Oh, those are dulcet tones! .....I have always believed that if you wanted to go Do Some Good with your own money, that was fine; and I have long been a fan (in much the same way that small children stare in helpless fascination at very large snakes) of the writings of the late Howard Philips Lovecraft. To suppose those things might intersect seems wildly unlikely. It's an unlikely sort of world. Lady and Gentleman, search 'bots of all ages, for your delectation: Williamson's Tunnels! The nickle read of this dime novel: beneath Liverpool (yes, the one in the UK) there exists a somewhat-lost and vast -- indeed, Cyclopean -- series of tunnels, excavated in the 19th Century by men working for tobacco magnate Joseph Williamson. They've never been entirely lost but many were filled in over the years by builders dumping dirt from excavations. A small band of Liverpudlians began digging them out some years back, with no end in sight! The most plausible explanation for this is that Williamson, who had grown up in poverty, was keeping men employed through a very deep recession; but clearly he was fascinated by tunneling as well. It's possible he was a member of some Millennealist sect and was building a refuge, or smuggling tobacco or other goods; the man's dead and he didn't leave a lot of notes. But whatever else it is, it's amazing stuff. Go have a look. And while looking, consider the number of men kept gainfully employed and the families fed by the eccentricities (whatever they were) of a single wealthy man. Or, How To Break The Rules. Big city, dark night. Low clouds. They glow! Photograph with bargain camera, crunch with bundled software: ersatz Parrish! Anyway, I liked it. YMMV. Not that I'm competitive. Na-na na naaah na! This one seems to have a time component, too. A Stunning Concept in Webcomix! The year is 2099 and an elite, tripartisan group of high-minded attorneys has got the Bomb -- rather a lot of Bombs, in fact. Armed with this irrefutable means of persuasion, they have set out to Do Good To Their Fellow Man. Of course the entire thing is a one-trick pony, since every last case and situation they take on ends up with 'em nuking all involved. Still, it could be good clean fun getting there. Move over, Judge Bean, for social justice that glows in the dark! Umm, I'm not being too sarcastic or anything, right? A) It's cool if you read my blog but you might want to cover your tracks better. B) E-mail if you want the BB pistol, I'm pretty sure it's not mine. And/or the Ruger mag, if you even still have that rifle. ...Right in The Rules, it sayeth: "Thou Shalt Post something each and every day, lest thy three faithful readers abandon thou and depart in favor of the funny pages," and I'm tryin'. Themeless today, however, so we must muddle through an' nevvah, nevvah surrendah! The Great Move continues and completion suddenly seems possible. I even found my spare car keys! But, grrr-dern-it, there is a gun show in town today and I have the itch bad. Maturity, do I really need it, or can I spare a couple of hours? -- I've been spending some time fussing over the Cat-Mother on every trip to the old place. She's a sweet, feral, little yellow tabby I've been feeding for six years. After a year of free food, she decided to make up to me and we've been pals ever since. She wouldn't be a problem to relocate, but her offspring and constant companion, a white-and-yellow tom, trusts no one. He was pretty wary before he got neutered and became more so afterwards, which is understandable. (The Mama cat, on the other hand, seemed a bit relieved after she was spayed; she earned her name fair and square, you see). -- As for the moving, in a box in a far back corner of the basement I found my ex's HS graduation cap and gown! Also a loaded Ruger .22 rifle mag and a semi-cool BB pistol. I called him about the cap'n'gown, which he picked up (and I never even saw him -- left it on the porch, next time I looked it was gone). Left the Ruger mag next to it but he ignored it. Somehow the "Marksman Repeater" skipped my mind entirely. Tsk, tsk. I've got a quarter here that says John Moses Browning's favorite great-granddaughter woke up on the move this mornin' yet again -- but you didn't hear it from me! Since I had a van anyway, I picked up some insulation to replace the fragile, tattered stuff well-meaning family members took down in my attic during the pre-move clean-up. I love 'em dearly and free help is always nice, but that's work I'd hoped to skip for a year. I need to get that stuff up. It's chilly. Did Saturday morning's errands on the scooter, quite a treat! Almost didn't make it at the bank, thanks to someone renegotiating a loan at the drive-up window. (Please, if it's a complex transaction, go inside! The drive-up is for those of us who finished our homework already). The city's repaved Keystone so I was above 50 mph on those 10" wheels -- laugh all you like, it'll still curdle your hair. Turned up my road and there was a maple in full golden color against the turquoise sky, having already totally carpeted the yard it shades. This is why I love Broadripple. (See photo. Colors not to scale. All leaves over 18...weeks). It has occurred to me that I have some pre-diced potatoes in the fridge, along with bacon and eggs. It has been some time since I indulged in Breakfast Hash, a treat you poor mortals may be missing. And you'll miss out on it this morning, too, unless you make your own. Wish me luck, those store-bought taters are time-savers but not always as good as starting with whole ones. Oh, here's a fine bit of Gumm'it workin' for the Common Good! (Don't mind me, I'm middlin' irked). State Quarters. 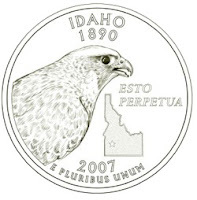 An Idaho fell into my hands this last week and my first thought was the simple Latin phrase: "Post hawk ergo propter hawk." But it turns out that's a peregine falcon. It's the thought that counts? On the other hand, Kansas may have gone for snark. I think they're underestimating the effects of inflation but I know my Dad would have snickered at the "Buffalo Quarter" and tossed his lucky nickel to whoever was near for them to check out. "One of those bought a candy bar when I was a boy!" he'd've said. How I miss him; the man had no respect at all for ijits. ...We won't even discuss the thing my state picked. I'd say I'm ashamed of it but the fact is, I'm ashamed of the whole program. It's just play-money trash and has been since before I was voting age, but do they have to rub it in? This is sort of Part Two to "Why You Should Not Take A Village..." and it's the one that may get me in hot water. Ahhh! Perfect weather for it. I left you on a note of bared-teeth libertarian purity. Okay; we live in a decidedly impure world. Let's say it was my kid, or one of my nephew's kids and insurance and savings didn't suffice. Let's say private charity came up dry. Am I going to sigh and let little Timmy die 'cos It Is Right? What would you think of an adult who let a child she was responsible for die when help was available? ...Thought so. You'd do what it took, and look down on anyone who would not. The desperation of good men and women is how such Rob-A-Village-To-Raise-A-Child programs persist. A significant number of those who have had to rely on such assistance will become vocal supporters. Many of the beneficiaries who don't go that far will fall silent. Why crush dissent when it will stifle itself? ...Guess it was a slow news day over at The View From The Porch, either that or the kindest mean girl I know decided to divert some traffic. Either way, it gives me the excuse I was lookin' for to add a link to her blog. I can't imagine who doesn't read it, but if you haven't, you should. Snarkier and snappier!